With five consecutive Pacific Division titles under their belt but no Stanley Cup Final victories or even appearances during that span, it’s now, perhaps more than ever, all about the final prize for the Anaheim Ducks. 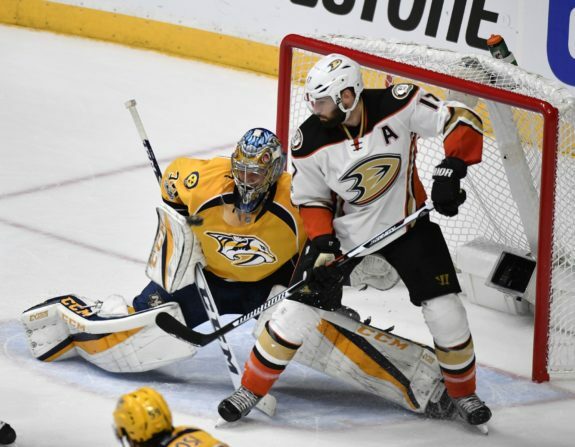 Last season, which was the first in head coach Randy Carlyle’s second stint with the club, the Ducks made a good run to the Western Conference Final before falling to the red-hot Nashville Predators in six games. Injuries late in that series to Rickard Rakell and Patrick Eaves, as well as a hip issue that bogged down Ryan Kesler and now has him sidelined to start this season because of the resulting surgery, did not help matters. That being said, every team has to deal with injuries to some extent, especially in the postseason. For Anaheim, this season will be all about getting into the playoffs and getting hot at the right time while maintaining at least some semblance of good health into and through the spring. The Ducks are still headlined by captain Ryan Getzlaf, the aforementioned Kesler, and a potentially resurgent Corey Perry. 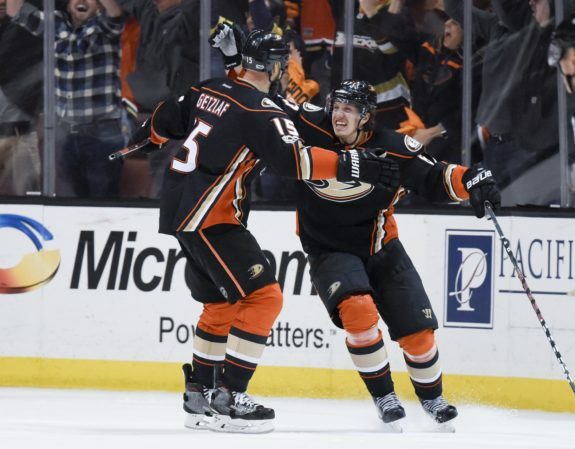 Along with these veterans though, the Ducks also boast a rich complement of young talent led by last season’s leading goal scorer Rickard Rakell, Jakob Silfverberg, Nick Ritchie, and a deep crop of talented defensemen, many of whom are under the age of 26. The Ducks’ depth will be tested early, as they will start the season already needing to stay afloat with injuries to Kesler, Hampus Lindholm, and Sami Vatanen; the latter two both had offseason shoulder surgery and are still recovering and rehabilitating, although Lindholm could be back relatively soon. So long as the Ducks are able to stay in the divisional hunt over the first half of the season as they deal with these injuries, then they have enough talent to be right there in the mix again, though they will not be satisfied without a Stanley Cup victory in June. Given their strong roster, the Ducks did not make many changes in the offseason, but they did make some less splashy moves to shore up the backup goaltending position, their bottom-six forward depth, and some insurance on the back end as Lindholm and Vatanen work to return to the lineup. The Ducks’ strong combination of veterans and rising young stars is most evident up front. The aforementioned Kesler will be sidelined for awhile—potentially until Christmastime or longer—to start the year. Given that, here’s how Anaheim’s lines could look on opening night versus when Kesler is back and the team is fully healthy. Rakell will likely move to the center position in Kesler’s absence. In the preseason, he played some time on a line with Andrew Cogliano and Jakob Silfverberg in what is likely foreshadowing for the regular season. Meanwhile, Chris Wagner, who has played at center in the past, played a fourth-line wing role to help round out the bottom-six. Once Kesler returns, Wagner and Logan Shaw would likely split time as the 12th forward, with Jared Boll possibly being in the mix as well. Kesler’s presence allows certain players to shift around and give the Ducks a formidable top-nine. 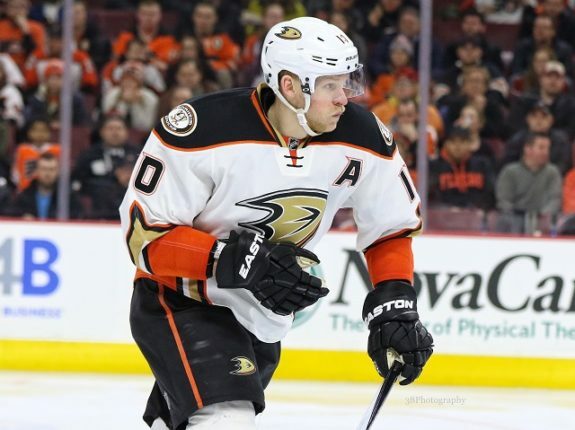 Without Kesler, the Ducks will lean heavily on the ever-improving Jakob Silfverberg, who last season set career highs with 23 goals and 49 points. The soon-t0-be 27-year-old Swede has shown the ability to play in all situations, and that versatility will prove to be more paramount than ever. Silfverberg might not be a center like Kesler, but he can chip in with a lot of the attributes Kesler brings, namely scoring and penalty killing. Look for him to build on last year’s success and thrive with the additional responsibility. With his lightning-quick shot release and strong instincts, 30 goals and 60 points should be within his grasp. After leading Anaheim with 33 regular-season goals in 2016-17, the 24-year-old Rakell figures to see quite a bit of time back at his natural position of center while Kesler is out of the lineup. Scoring goals playing on Ryan Getzlaf’s wing is one thing, but as a center, Rakell will be counted on to not only create more of his own offense but also to shoulder even more responsibility in all three zones. 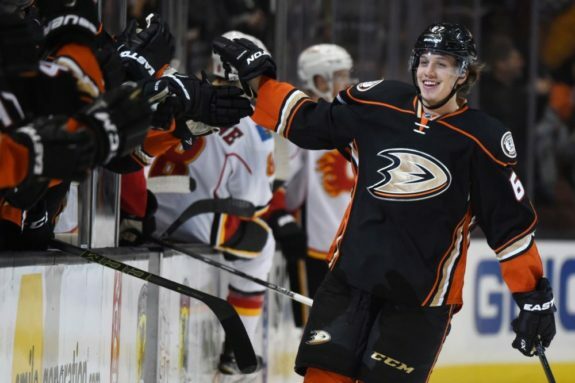 Rakell could very well become the next face of the franchise once Getzlaf and Perry ultimately hang up their skates. In the present, though, the question of whether or not he is able to effectively pivot to the pivot position will have huge implications on how the Ducks fare this season. Luckily for Anaheim, Rakell already has enough tangible and intangible skills required to succeed in that role and is a smart enough player that he can continue to learn and improve quickly. The Ducks’ bottom-six houses most of their question marks going into the season. They have plenty of young talent, but many of those players are lesser-known commodities. 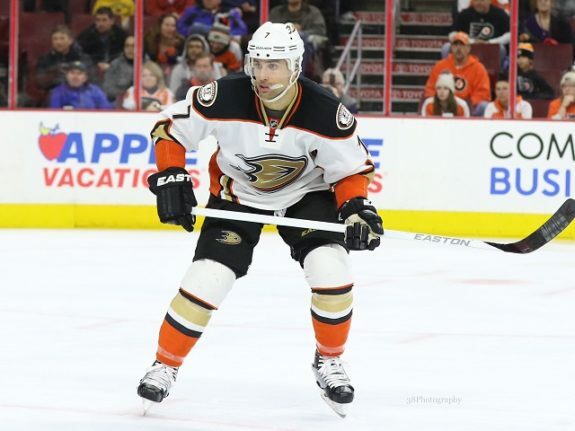 With Andrew Cogliano, the Ducks should know exactly what they are getting: a speedy, tenacious third-liner who can kill penalties, play well in a defensive role, and periodically chip in offensively (he had 16 goals and 19 assists last season). Not to beat a dead horse, but depth and the ability of each forward to elevate his game just a bit will be of great importance for the Ducks in the first half of the season during Kesler’s absence. At age 30, Cogliano is an established NHL player, but Anaheim will be counting on his contributions and cannot really afford to see the beginning of a decline in his play; in fact, based on preseason line combinations, they might need him to step up into a temporary top-six forward role. Of course, Cogliano has more than proven his durability, having never missed a game since breaking into the league with the Edmonton Oilers in the 2007-08 season. That spans 786 regular-season contests and another 60 in the playoffs. A model of dependability, Cogliano is the ultimate professional who just goes about his business and flies under the radar. Given the Ducks’ status to start 2017-18, the spotlight is now shining a bit more on the importance of those qualities. With Jacob Larsson being sent back down to the AHL, it seems that 24-year-old Jaycob Megna, a hulking 6-foot-6 defender who has spent his career in the minor leagues to this point (save for one game with the Ducks last season), has earned a place in the opening-night lineup, or at least on the roster. Assuming that’s the case, Korbinian Holzer will serve as the seventh defenseman before Lindholm and Vatanen return. The returns of Lindholm and Vatanen will likely force at least one of Holzer or Megna off the roster. Bieksa would likely serve as the seventh defenseman, perhaps splitting some time with Beauchemin. Cam Fowler, who signed an eight-year extension this offseason for an average of $6.5 million per year, is already someone on whom the Ducks have leaned heavily, as he led the club in average ice time per game last season. With Lindholm and Vatanen on the shelf to start the season, Fowler becomes that much more indispensable. Fowler’s extension does not kick in until next season, but he already has and will continue to embody a critical role for the Ducks. He is coming off arguably the best season of his career—11 goals and 28 assists while taking on the number-one role in averaging just under 25 minutes of ice time per game—and will be counted on to build upon that further. 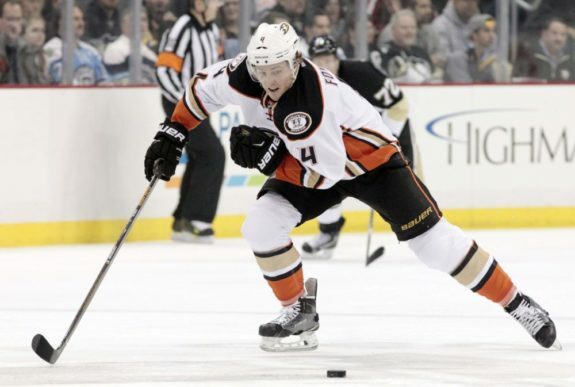 Fowler has quickly moved from a promising, talented young blueliner to a leader on Anaheim’s back end. In the absence of Lindholm and Vatanen to start the season, Fowler will have to improve his ability to drive possession while still getting top minutes against opponents’ top lines. 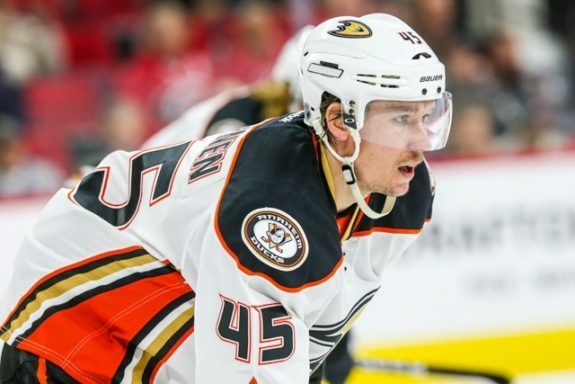 It’s a difficult and almost paradoxical thing to ask, but it’s what Fowler will need to provide in order to keep the Ducks at least near the top of the division standings over the first couple of months. The good news is that Fowler has taken major strides in all areas of his game, so it’s not unreasonable to believe that he will continue to do so at age 25. Josh Manson is another young defenseman who has seen steady improvement in his game. He will turn 26 just after the regular season begins, so he has proven to be somewhat of a late bloomer. Despite that, or perhaps because of it, the Ducks should expect many more years of solid play out of him. Manson, who tallied five goals and 12 assists in 2016-17, will likely never put up huge offensive numbers, but the strengths of his game are his, well…strength, physicality, and defensive awareness. He appeared in all 82 regular-season games last year and proved that his physical play was calculated and not something that took away from his puck or positioning skills, as his possession metrics were among the best on the team. Manson will be a key figure to step up and eat some of the minutes that would otherwise go to Lindholm and Vatanen, but his steady improvement over the past couple of years and his underlying statistics suggest that he is indeed ready for more responsibility regardless of any injuries to other members of the blue line. Lindholm might miss the very beginning of the season, but when he comes back, his already excellent presence in all areas and his continued growth will be key in ensuring Anaheim remains a top Cup contender. The sixth overall pick from the 2012 draft is still only 23 years old but plays with the savvy and calmness of a seasoned veteran. He was the Ducks’ best possession-driving defenseman last year and is possibly their most reliable player in the defensive zone. The steadiness in Lindholm’s play contributes to his standing as one of the league’s more underrated defensemen, but if he begins to tap into his offensive potential with a bit more frequency and consistency, he might shed that label. He missed some time at the beginning of last season as well, but that was because of a contract holdout situation. In all, he tallied six goals and 14 assists in 66 games. While those offensive numbers are hardly eye-popping, he did hit the 30-point mark in each of his first two seasons and the 10-goal mark in 2015-16. The talent is there, and if he can add more of that element to his game, the Ducks will be that much more difficult to contain. The aforementioned contract dispute led to a great result for Anaheim, as Lindholm is locked up for five more years (including this one) at an annual cap hit of $5.2 million. That number should prove to be more and more of a bargain as the sixth overall pick from 2012 continues to emerge as a star defenseman. 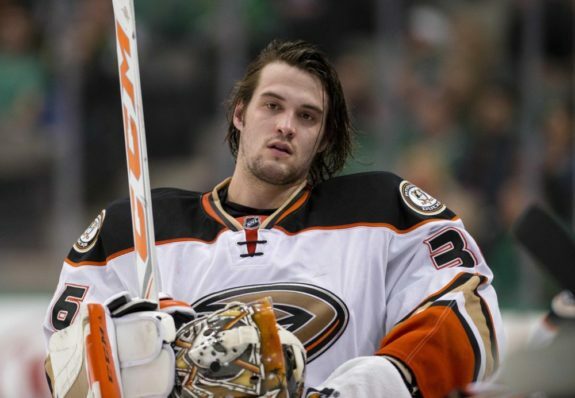 John Gibson, 24, is Anaheim’s present and future in net. He appeared in a career-high 52 regular-season games in 2016-17, posting 25 wins with a very solid .924 save percentage and 2.22 goals-against average. 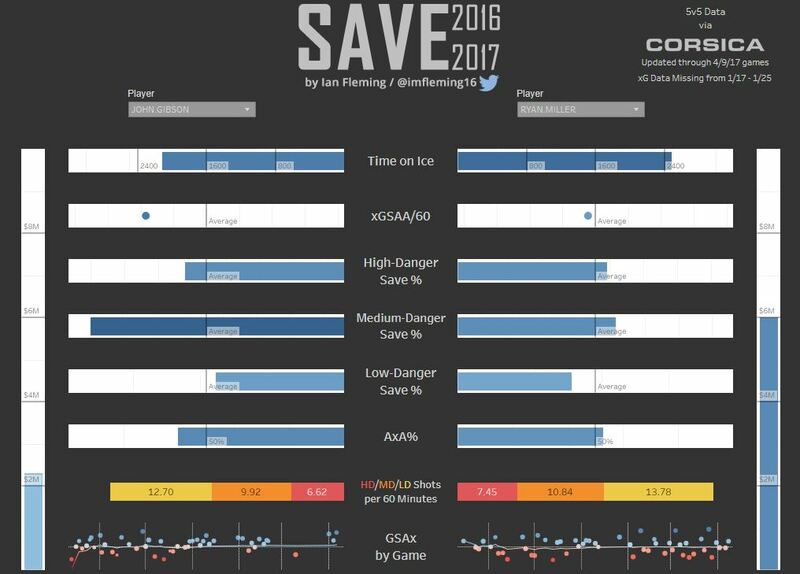 A further deep dive into Gibson’s numbers paints a picture of a goaltender who excels in stopping medium and high-danger shots against, and as a result yields fewer goals than an average netminder would when facing the same shots. Gibson should see more than 52 games this season as he continues to grow and work towards becoming a household name among the NHL’s goaltending elite. To spell him though, as well as mentor him, Anaheim brought in veteran goalie Ryan Miller, formerly of the Vancouver Canucks, St. Louis Blues, and most famously, the Buffalo Sabres. While this might have been the Ducks’ splashiest free-agent pickup this offseason, the 37-year-old’s best days are clearly behind him; as illustrated above, Gibson outshines him across the board, though Miller had a more difficult workload behind a worse team in the Canucks. 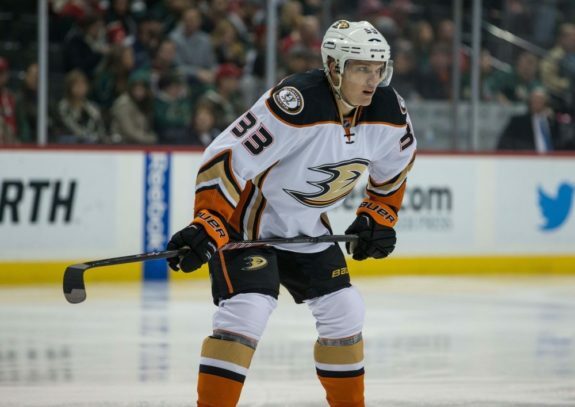 Nevertheless, at an annual cap hit of just $2 million for two years, Miller will provide value for the Ducks. He is a solid backup option and can share his wisdom and experience with Gibson as the latter enters the prime of his career and looks to build and maintain a consistent level of excellence for years to come. The Ducks also have further goaltending insurance in Reto Berra, another offseason signing who will start the season in the minors. They should be set in net. 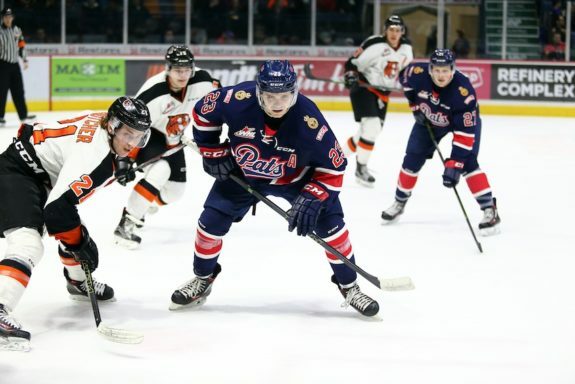 One could argue that winger Nick Ritchie had a breakout season in 2016-17, playing in his first full season and posting 14 goals and 14 assists before adding another four goals in the playoffs, including a Game 7 winner in the second round against the Edmonton Oilers. Nevertheless, the Ducks’ 10th overall pick from 2014 could be primed for a major uptick in those scoring totals. He has all the tools to become a classic power forward: size (6-foot-2, 234 pounds), physicality, tenacious forechecking, and goal-scoring touch. Anaheim will need him to tap into those skills more consistent basis, especially while Kesler is recovering from his surgery. Given the opportunity that lies in front of him, as well as his own talent and natural progression, Ritchie should break the 20-goal mark and could possibly go a bit beyond that. He has the ability to bring several of the traits that define Kesler, and the Ducks will be counting on him to do just that. Look for him to make the most of his increased responsibility. If six-time 30-goal scorer Corey Perry is able to bounce back from last season’s underwhelming 19-goal output, the Ducks’ offense will be extremely dangerous, even without Kesler. While Perry is on the wrong side of 30, a deeper investigation into last season’s numbers validates the notion that he was plagued by bad luck. A return to normalcy in his shooting percentage should be expected, but now Perry has to play well enough at age 32 to fully prove that last year was an aberration and not a sign of true decline. Although he might never reach the 40-goal mark as he has in years past, he could very well touch 30 again with just a modicum of decent puck luck relative to last season. Potentially getting more ice time back on the wing of setup-man extraordinaire Getzlaf, his longtime partner in crime, should also help. The Ducks had a subpar preseason, struggling offensively with just 16 goals in seven games while playing to a .500 record of 3-3-1. Of course, contrary to the actual season, win/loss results mean almost nothing in the preseason. Furthermore, the aforementioned injuries plus nagging injuries to other veterans kept many of the team’s big names out of action. Nevertheless, the Ducks had to be hoping to see more out of some of their top prospects, but things did not really pan out that way. Sam Steel and Jacob Larsson were both relatively unimpressive, though there is not too much cause for concern in the grand scheme of things. In any event, Steel, at age 19, was more of a darkhorse candidate to make the big club a year after leading the CHL in scoring, but there was a slightly bigger opportunity with Kesler’s injury. Despite that, he ultimately did not do enough to earn a roster spot, and Anaheim sent him back to the CHL. With Steel going back to junior, he won’t be in line for a call-up, but Larsson will. Larsson, 20, seemed to have a stronger opportunity to crack the Ducks’ opening-night roster, but after his pedestrian preseason, he will start the year in the AHL with the San Diego Gulls. In any event, the 27th overall pick from the 2015 draft is likely going to be one of the first defensemen in line for a call-up in the event of further injuries or other circumstances. One of the brightest spots of the Anaheim’s exhibition season came from an unexpected player. Left winger Giovanni Fiore, 21, spent last season with the Cape Breton Screaming Eagles of the QMJHL, notching an impressive 52 goals and 38 assists in 61 games. As an over-ager, he flew under the radar a bit in terms of his NHL prospects but eventually signed an entry-level contract with the Ducks before impressing in the preseason. Fiore took advantage of his opportunity by consistently being one of Anaheim’s most noticeable players in his four preseason contests, picking up a goal and an assist during that time. “He really seems to be a kid that has kind of come off the mat,” head coach Randy Carlyle said earlier in the preseason. Alas, the Ducks ultimately assigned Fiore to the AHL for a bit more seasoning, but if he can keep up his solid play and continue to grow and develop at the AHL level—still a jump up from junior hockey—he could find himself back with the Ducks before long. He has at the very least earned top-of-mind status with respect to forward call-up candidates. Another call-up candidate at the forward position is winger Kalle Kossila. At 24, the Finnish Kossila is a bit older in the context of prospects, but as such might be more NHL-ready despite a potentially lower ceiling than others. He did appear in one regular-season game for the Ducks last season and picked up a goal in four preseason appearances this year. Kossila’s playmaking ability was on display with the Gulls last season, as he tallied 34 assists to go along with 14 goals in 65 games. Lastly, Swedish defenseman Marcus Pettersson, along with Fiore, acquitted himself well in the exhibition games. At 6-foot-4 and 180 pounds, the 21-yeard-old Pettersson could stand to bulk up a bit more but is nevertheless very adept at using his long reach to his advantage. He might never fill up the traditional stat sheet with high point totals, but his skill set and development should see him evolve into a dependable player who makes subtle plays to maximize possession and move the puck efficiently. 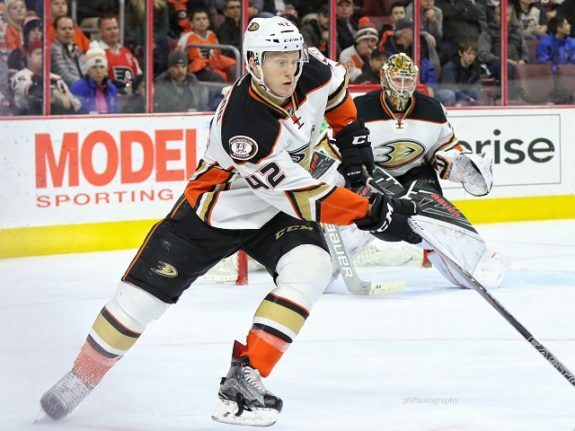 While not on the Ducks’ roster to start the year, Pettersson is set to embark on his first full season in North America with the Gulls, which should help him as he comes closer to a full-time NHL gig. Some NHL time could also be in the cards this season if Anaheim finds itself needing to bring up another defenseman, even on a temporary basis. 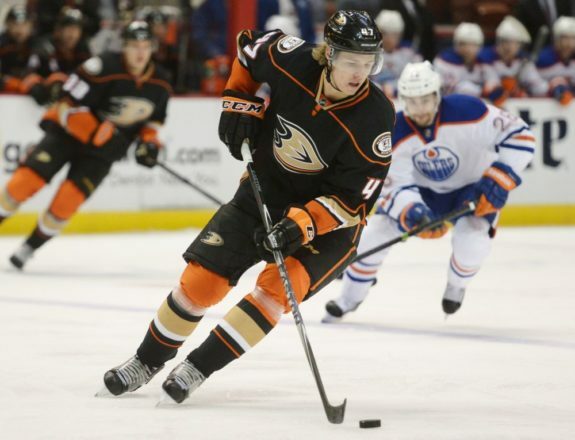 The Ducks should find themselves as a top contender in the Western Conference by the end of the season. Getzlaf is still as good a playmaker as ever, and Perry should have at least somewhat of a bounce-back campaign. Younger players like Ritchie and Rakell will continue to develop and help lead this team offensively, along with the steadily-improving Silfverberg. 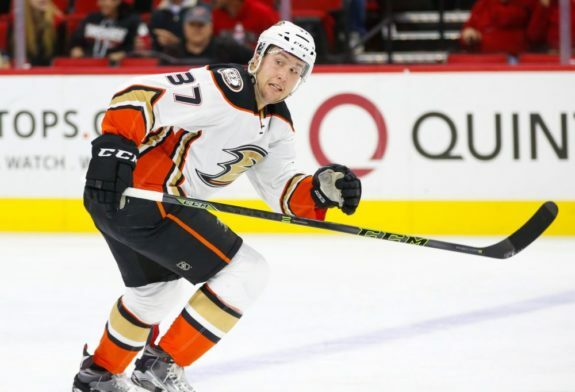 Anaheim also does not lack key role players like Cogliano, whose durability will be especially important as the club fights through some early-season injuries. Beyond the forwards, the Ducks have one of the deepest blue-line groups in the league and a solid goaltending tandem in rising star Gibson and veteran Miller. The Ducks have won the Pacific Division five years in a row. That does not matter as much as winning the ultimate prize at the end of the playoffs. They have a good mix of players and are largely the same from a roster perspective as last year’s Western Conference Final team. The early-season injuries to Kesler, Lindholm, and Vatanen will likely induce a slower start than the Ducks would like, which could very well end their streak as division champions, but as long as they are healthy at the end of the regular season, they will be a team no one else will be clamoring to see in the playoffs. Be sure to comment below with your opinions on how the Anaheim Ducks will fare in the 2017-18 season, and/or head over to the THW Twitter feed or Facebook page to discuss the Ducks and anything else related to the NHL.